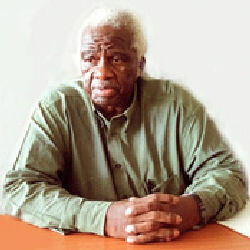 When Mazisi Kunene died this past August, it was in the city of his birth, Durban, South Africa. Kunene, 76, had spent over thirty years in exile from his native land before returning to it in 1993. In 2005, his country honored him with the title of Poet Laureate. It was a finally fitting tribute from the land that he never stopped loving, even through the years of exile. Born in 1930, Kunene was awarded the Bantu Literature Competition Award in 1956. In 1959, he left South Africa as a member of the African National Congress, and became an outspoken voice for the ANC throughout the world. He was appointed chief representative of the ANC in Britain and Western Europe in 1963. Throughout his life in or out of exile, he was an outspoken critic of apartheid. By 1970, Kunene was highly regarded as a poet and writer. He taught at University College in Rome, Lesotho and later, at UCLA as a professor of African Literature. In 1970, Kunene published his first volume of poetry, Zulu Poems, which was banned in his native South Africa for years. It was written, as were all of his works, in Zulu and then translated to English. He is most well-known for his two epic poems, Emperor Shaka the Great and The Ancestors and the Sacred Mountain. His other collections of poetry include Anthem of the Decades – A Zulu Epic. In a keynote address given on the occasion of Kunene”s return to South Africa in 1993, Ntongela Masilela notes that Kunene is one of the greatest living African poets, and draws his lineage directly from the ancestral roots into the present day. This was echoed by in 1993 when he was named Africa”s Poet Laureate by Arab-speaking African Countries. From 1993 till his death in August, Kunene continued to both write and teach. The vast majority of his work is as yet unpublished, and those who know it believe that when it is published, it will form one of the greatest bodies of African literature known to the world. Mazisi Kunene is yet another example of poets who lived their beliefs and wrote them to share with the world. His work has the sweep and feel of true epic poetry. His voice is one for the ages.